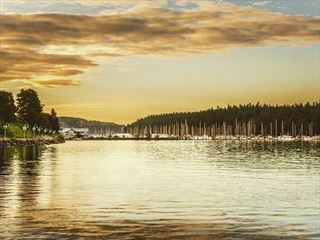 We’ve created this relaxing itinerary to showcase a holiday on Vancouver Island in British Columbia that can be enjoyed at a gentle pace. You will be able to explore the best beaches, the wildest coastal routes, the friendliest seaside villages and towns, and still have time to go whale and wildlife watching. We’ve selected some great waterfront accommodation and in each location we can recommend the best excursions for you to enjoy. We will tailormake this itinerary to fit your interests and schedule. 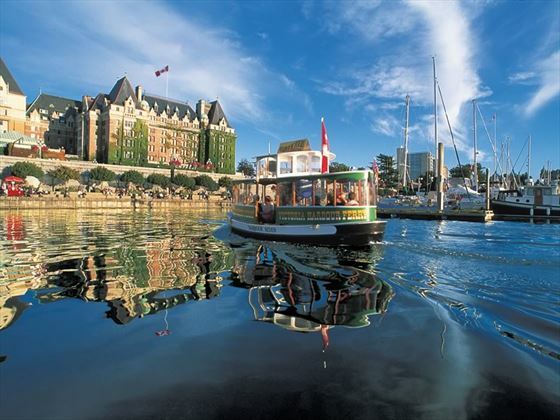 Fly to Victoria the capital of British Columbia on Vancouver Island, and check in to your hotel for two nights. We are happy to tailor make this itinerary to suit you and you could start this itinerary in Vancouver and then either fly or take the ferry over to Victoria. Just let us know and we can extend this itinerary. There’s a great urban kayak tour you could do in Victoria, which we can book for you, so you get to see both the city, the harbour and wildlife up close. We’d also recommend a walk along the footpath along the harbour front to Fisherman’s Wharf, where you’ll find great street food in brightly coloured kiosks and some cute boutiques. You could also take a scenic floatplane tour, over the city of Victoria and then over the Strait of Juan de Fuca with the Olympic Mountains in the distance. 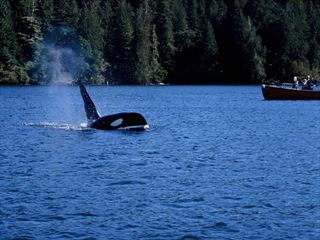 There’s also the option to enjoy a whales and wildlife cruise – just let us know if you’d like this booked for you. 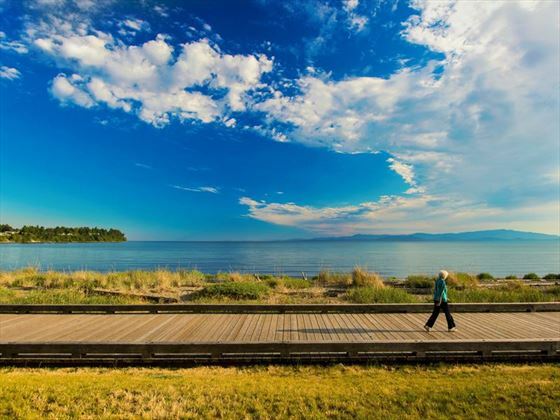 Pick up your hire car and drive to the seaside town of Parksville on the eastern coast of Vancouver Island. Check into the beach front hotel and then take a stroll along the boardwalk. We’ve included two nights here on this itinerary so you have time to unwind. Rathtrevor Beach Provincial Park is worth a visit with huge stretches of sandy beach at low tide. Englishman River Falls is also just outside the town, and you can take the short walk to a couple of lovely waterfalls and natural swimming pools. 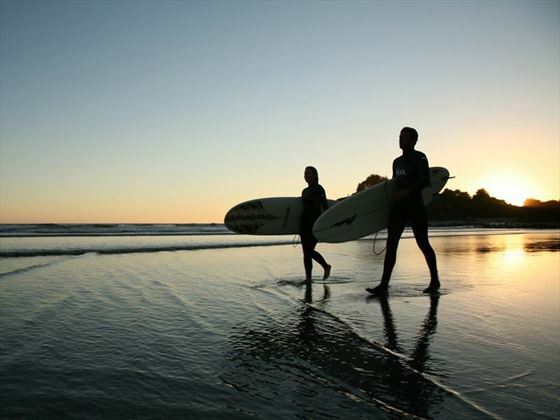 Today you’ll traverse the island to the west coast and the surfers paradise of Tofino. 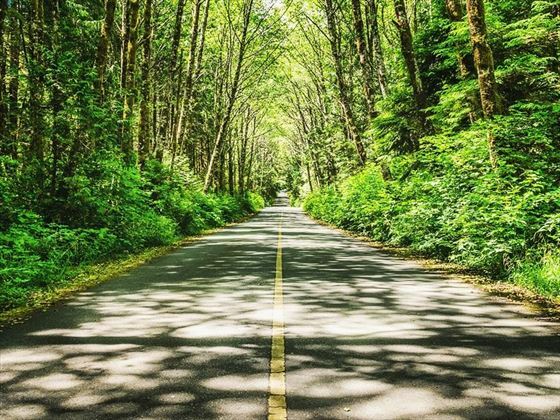 En route you’ll drive through a series of lovely Provincial Parks, such as Taylor Arm, Kennedy Lake and Clayoquot Plateau Provincial Parks, and the final stretch takes you through the spectacular Pacific Rim National Park. You’re in Tofino for two days, so we could book you an excursion. How about a half day guided sea kayak tour to Meares Island? Or a cruise through Clayoquot Sound to Hot Springs Cove where you can relax in the thermal springs. This is also a great place to go whale watching on either a small zodiac to get you close to the action or a larger vessel with shelter and facilities. 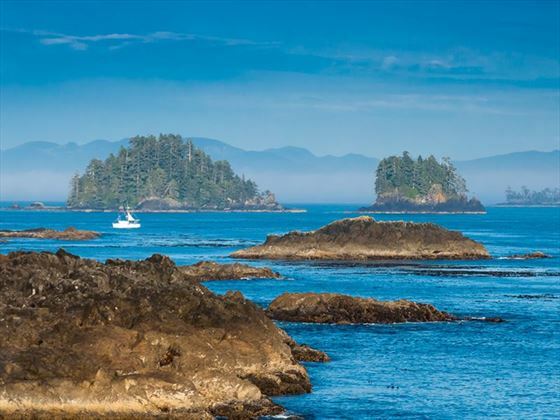 Enjoy a picturesque drive through the Pacific Rim National Park down to the fishing village of Ucluelet – the name meaning “people of the safe harbour” in the indigenous Nuu-chah-nulth language. 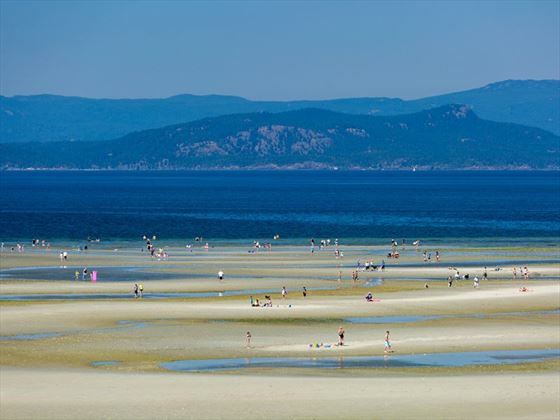 The beaches here are wildly beautiful and are great for beachcombing, hikes and picnics. Explore Big Beach, Half Moon Bay and Wickanainnish Beach, and enjoy the stunning sunsets in this picturesque, remote location. Cross to the eastern coast of Vancouver Island and the second city of Nanaimo. Neck Point Park is a great place for a walk, with well-marked paths taking you along the beach and through the forest, and offering great views of the British Columbia mainland and even over to Mount Baker in Washington State USA. You might even spot eagles, seals and whales on this lovely amble. 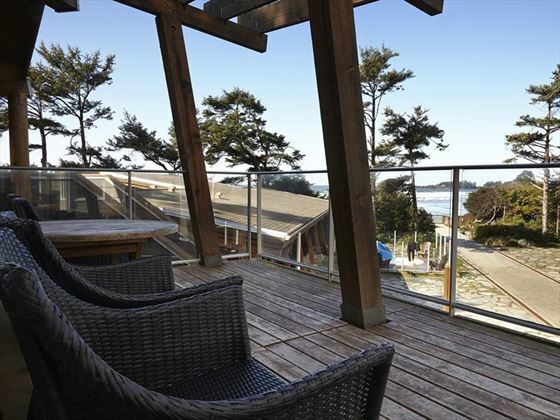 Heading down to the very south of Vancouver Island, you’ll find the coastal town of Sooke. Here are dark green forests leading to super sandy shores. 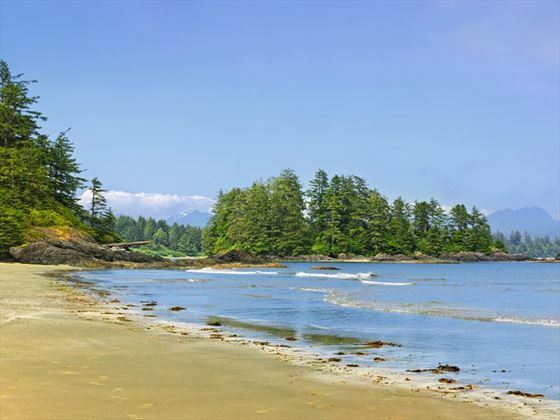 French Beach Provincial Park is a particular favourite and the Sooke Potholes are also worth a visit for a bracing swim in the summer months! The Sooke Region Museum is worth a visit and also has a nice gift shop for a few souvenirs. If you’re looking for a challenging hike, then head up Creyke Point in the East Sooke Regional Park, where you’ll be rewarding with spectacular views of the ocean and Olympic mountain range. 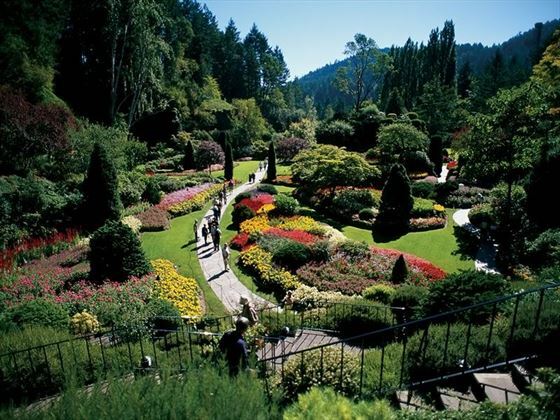 It’s time to fly home, but if you’re schedule allows, then we recommend a visit to Butchart Gardens on your way to the airport. These historic gardens are a beautiful oasis at any time of year, and a lovely place to stroll before getting on a flight home.